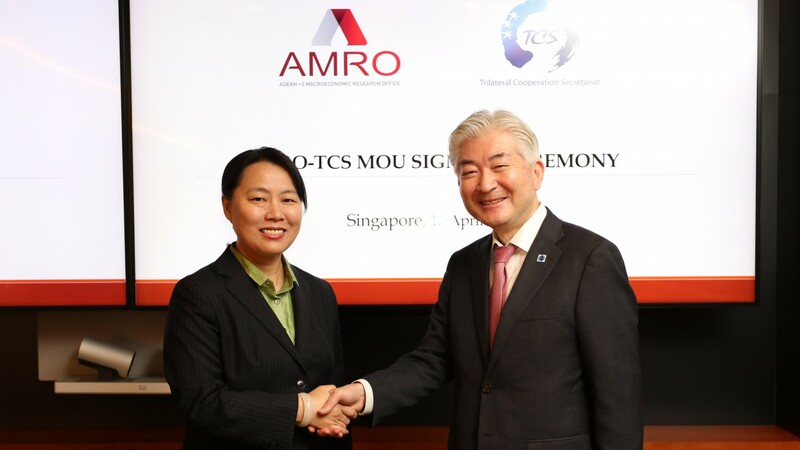 AMRO Director Dr Junchang Chang (left) and TCS Secretary-General Mr. Jong-heon Lee sign an MoU to strengthen collaboration between two institutions in Singapore on April 17, 2019. SINGAPORE, April 17, 2019 – The ASEAN+3 Macroeconomic Research Office (AMRO) and the Trilateral Cooperation Secretariat (TCS) signed a Memorandum of Understanding (MoU) today. The MoU provides a general framework to strengthen cooperation and collaboration in matters of common interest, enhance capacity building to better fulfil their respective mandates, and substantially co-contribute to the regional economic and financial cooperation and stability. In particular, the MoU covers the organization of joint activities such as seminars, workshops, dialogues, symposiums, forums or other events facilitating regional and global economic and financial cooperation among China, Japan, Korea and ASEAN Member States. The MOU also covers joint research and information sharing on regional economic and financial affairs between AMRO and TCS, as well as capacity building. TCS Secretary-General Mr. Jong-heon Lee said, “TCS and AMRO have both dedicated their focus and expertise to fostering regional cooperation. Since the two organizations have shared interest and unique strengths, leveraging comparative advantages will help each other fulfill their respective mandates and co-contribute to the economic and financial cooperation and stability in East Asia in the long term.” He believed that now is the right moment for both organizations to strengthen their cooperation. AMRO is an international organization comprising 10 members of the Association of Southeast Asian Nations (Brunei Darussalam, Cambodia, Indonesia, Lao PDR, Malaysia, Myanmar, Philippines, Singapore, Thailand, and Vietnam) and China; Hong Kong, China; Japan; and Korea. Its objective is to contribute to macroeconomic and financial stability of the region through conducting macroeconomic surveillance and supporting the implementation of the Chiang Mai Initiative Multilateralisation (CMIM), a multilateral currency swap arrangement among ASEAN+3 members. TCS is an international organization established with a vision to promote peace and common prosperity among China, Japan, and Korea. The objective of TCS is to contribute to the further promotion of cooperative relations among the three countries in the areas of political affairs, economic affairs, and socio-cultural affairs, through providing support for trilateral consultative mechanisms, exploring and facilitating cooperative projects, promoting understanding of trilateral cooperation, networking with other international organizations, and compiling database and conducting research.